The Alsace region is located in north-eastern France and is famous for its wine, its colourful half-timbered houses and its castles which sit enthroned on the summits of the Vosges mountains. Since the 1st January 2016 the administrative region of Alsace has been part of the new Grand Est region along with Lorraine and Champagne-Ardenne. The capital Strasbourg is home to one of France’s most beautiful Gothic cathedral, a pedestrian old town centre, and the country’s premier Christmas Market. It is also where the European MPs meet at the European Parliament. South of Strasbourg is another major touristic town: Colmar. From there you can easily journey through the Route des Crêtes of the Vosges and the Wine Route. The Alsace vineyards extends across the hills of the Vosges at between 200 and 400 metres high, over some 14,000 hectares of grapevines which produce an average of 150 million bottles of wine. Benefiting from local microclimates, the Alsatian vineyards are bordered to the West by the natural barrier of the Vosges, and to the East by the Rhine Plain which has its own large natural border: the Black Forest in Germany. The Alsace region is also known for the richness of its gastronomy. The Kugelhopf is an emblematic Alsatian dessert. Other specialities from Alsace include sauerkraut (choucroute), tarte flambée, or Christmas cookies locally known as Bredalas. To the South of the region lies the city of Mulhouse and the rural land of the Sundgau which reaches the Swiss border in the Jura mountains. Easily accessible by TGV from Paris or Lyon, Alsace is definitively a region worth a visit… should it be for the sight of its emblematic bird: the white stork! 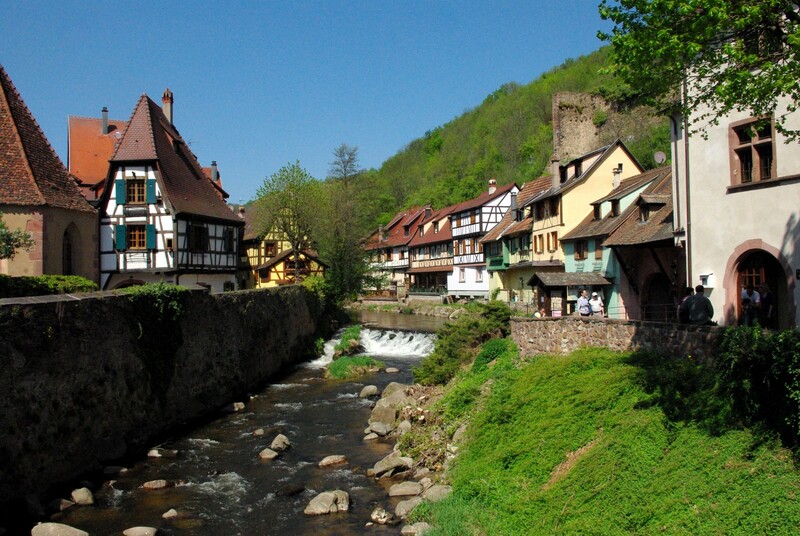 The Alsace region’s touristic appeal is closely linked to its rich history. The region was originally populated by Celtic tribes who founded Argentorate (now Strasbourg) towards the end of the 3rd century BC. In 58 BC, Julius Caesar’s troops conquered the region and brought with them the Roman culture, built roads and imported vines. During the 4th century, the power of Rome was reduced due to incursions by the Barbarians. The Alemanni tribes drove out the Romans and established themselves in the Upper Rhine. In 496 at the Battle of Tolbiac, Alsace came under the authority of Clovis, recently converted to Christianity. In the Middle Ages, the fate of Alsace lay in the Germanic world as the province had been an integral part of the Holy Roman Empire since 962. Several seignories appeared with powerful dynasties at their head: the Habsburgs in Upper Alsace, the Ribeaupierres (or Rappolstein) in Central Alsace and the Lichtenbergs in Lower Alsace. In addition to these three dynasties, the region was divided up into many territories meshed with each other, operating under the authority of little lords, laymen or clergymen. This situation was accelerated by the reduction of imperial power and the increasing wealth of the urban bourgeoisie. In the 13th century, a movement of emancipation by the Alsatians developed. In the prosperous city of Strasbourg, the bourgeoisie took over the local authority of the bishop. In 1354, an alliance of ten prosperous merchant towns of Alsace, the Décapole, was agreed upon, with imperial protection. Meanwhile, the Habsburg dynasty, fervently catholic, controlled a vast territory in southern Alsace (the Sundgau), in Breisgau, in today’s northern Switzerland and in Vorarlberg, known as Anterior Austria (Vorderösterreich). The Reformation reached the Alsatian Province leading to the conversion of Strasbourg and Mulhouse to Protestantism. The Thirty Years’ War erupted in 1618 following extreme tension between the catholic Emperor (a Habsburg) and influential protestant princes. It was further complicated by the intervention of France, which had long been hostile to the European ambitions of the Habsburgs. Eventually, the king of France forced the Habsburgs to surrender Alsace to him, which they did by withdrawing from the other side of the Rhine. On 24 October 1648 the Habsburgs signed the Treaty of Westphalia, providing for the transfer of Alsace to France. From that time the Alsace region was ruled by France and remained under its national colours until 1871. During the French Revolution (1789), Alsace was administratively reorganised into two départements: the Bas-Rhin to the north and the Haut-Rhin to the south, with their respective administrative centres of Strasbourg and Colmar. The franco-prussian war in 1870-1871 ended with the surrender of the French army and the annexation of the province (less Belfort) and the Moselle département in Lorraine to the newly created German reich. In the aftermath of the First World War, Alsace returned to republican France. Paradoxically, the joining of Alsace to France posed several problems, especially in terms of adjustment. Many Alsatians campaigned to obtain some recognition of their local status concerning local administration and dialect. Cultural life was in part suppressed by linguistic pressure from French authorities confronted by regional culture. In August 1940, an armistice treaty was signed between Germany and defeated France. In order to “Germanise” Alsace, the occupiers needed to resort to drastic measures. The Alsatian people were considered German citizens (Volkdeutsche), the use of French was banned and was a punishable offence and German became the obligatory language once again, with street names being translated and displayed in German. Young men of Alsace faced compulsory conscription to the German army. And since they could not really be trusted, Nazi command sent them to the Russian frontline, from where few of them returned safe and sound. This tragic wartime episode gave them the name “les Malgré-Nous” (“in spite of our will”). The liberation of the province was a story.of long suffering. The Allied bombings of the “Pocket of Colmar” during the 1944-1945 winter of 1944-1945 destroyed several villages. While Strasbourg was liberated on 23 November 1944 by Leclerc, the last German troops to surrender in Alsace took place on 20 March 1945. Alsace had changed hands four times within 75 years between France and Germany. The end of the Second World War signaled that it was time for the reconstruction and reconciliation of the peoples of Europe. In 1949, ten European States (Belgium, Denmark, France, Ireland, Italy, Luxembourg, Norway, the Netherlands, the United Kingdom and Sweden) founded the Council of Europe and based it in Strasbourg. The capital of Alsace is currently the seat of more than a dozen institutions and organisations, both European and international, including the European Parliament and the European Council of Human Rights. The Alsace region covers an area of 8,280 km2 (190 km long by 50 km width) which represents 1.5% of the total area of France. Being the smallest administrative region of continental France, Alsace stretches from south to north along the Rhine which borders its east flank. The Alsace region is bordered by the German Lander of Rhineland-Palatinate to the north and to the east, across the Rhine, by the Lander of Baden-Württemberg. To the south, the Jura mountains mark the border with Switzerland from Basle to the vicinity of Porrentruy. In the South-West, the Gate of Burgundy opens Alsace to Franche-Comté, while the crest of the Vosges mountains serves as a natural border with Lorraine. the plain of Alsace where the Ill River flows from the Jura mountains to the north of Strasbourg where it joins the Rhine, is dedicated to cereal production. A few important forests are also found here: the Haguenau forest to the North and the Hardt to the South near Mulhouse. to the West, the Vosges mountains are cut into by large valleys where tributary rivers of the Rhine flow: the Doller, Thur, Lauch, Fecht, Weiss, Liepvre, and Bruche. The culminating point is the Grand Ballon (1,424 m). Forests alternate with high pastures (Hautes Chaumes). The Vosges foothills (collines sous-vosgiennes) mark the transition between the High Vosges and the plain. Also called Piémont Vosgien, this area is covered with the Alsatian vineyards, stretching from Thann to Wissembourg. to the North-West, the hilly Alsace Bossue (Hunchbacked Alsace) is located where the Lorraine plateau meets the mountains of the northern Vosges. to the South of Mulhouse, the rural Sundgau has its own distinctive geographic character. The hills are followed by the foothills of the Jura mountains in the extreme South. This is where the Ill River starts its course. Alsace has two distinct climatic regions: mountainous in the Vosges and semi-continental on the plain. Temperatures can range between extremes of 40°C and -30°C but annual extremes of 25/30°C and -5°/-10°C are much more frequent (30°/40°C difference). Record high temperature: 40.9°C on the plain on 13 August 2003. Record low temperature: -30.2°C at the Grand Ballon (1,424 m) on 10 February 1956. The topography of Alsace, the Vosges and the Black Forest in Germany all play a major role in the local climate. From Colmar, next to the foothills and at the base of the Vosges mountains, clouds arriving from the West are forced to rise and fall as precipitation over the high summits, hence protecting the lower area from rain. With an annual recorded rainfall of 530mm, Colmar and its region take advantage of one of France’s driest climates, making it ideal for vines to grow on the southern slopes. This feline was reintroduced to the Vosges in 1983 after nearly two centuries of absence. Today, the mountain range provides a habitat for about 30 lynxes. The lynx is hard to see as it is a nocturnal and lonesome hunter. It is recognisable with its brown-spotted fur and the black brushes of hair on its ears. This bovid was reintroduced to Alsace in 1938. There is now a population of about 900 chamois in the Vosges, particularly in the high ridges of the valley of Munster above 800 metres. Protected in Italy since 1976, the gray wolf has since entered France by the Maritime Alps At least 50 wolves were discovered in the French Alps in 2000. In 2011, it was confirmed that wolves had reached the Vosges. The last wolf sighting in France prior to their reappearance dates back to the 1930s. The friendly white storks, the iconic emblem of Alsace, are found in large numbers throughout the region. However this has not always been the case. To the distress of the Alsatian population, the white bird almost disappeared from Alsace in the 1970s (only nine pairs were alive in the Upper Rhine region) but thanks to a conservation programme, storks were reintroduced in Alsace and their numbers now exceed 270 pairs. White storks are one of the region’s most beloved symbols and for many centuries they return every year from Africa to announce the coming of spring in France. Sous-préfectures: Haguenau, Molsheim, Saverne, Sélestat, Wissembourg. Sous-préfectures: Altkirch, Guebwiller, Mulhouse, Ribeauvillé, Thann. “Agglomérations” in France are contiguously built-up areas in France, also called “unité urbaines”. The agglomération of Strasbourg comprises 485,000 inhabitants when the German city of Kehl Am Rhein is included. Saint-Louis and suburbs form part of the Basel agglomération in Switzerland which comprises 830,000 inhabitants in Swiss and German towns. Even though Alsace is situated 400 km from the centre of Paris on France’s eastern border, it enjoys an enviable central position in Western Europe. The Upper Rhine region of which Alsace is part, is located at the heart of the European Megalopolis which stretches from Liverpool to Geneva. Taking the shape of a crescent, this “blue banana” is a continuous corridor of urbanisation with a population of 110 million which adds up three quarters of the EU’s purchasing power. Alsace is the first export region of France based on the export value per inhabitant. 35% of the companies based in Alsace deal with foreign trading partners (mostly German, Swiss, American, Japanese and Scandinavian). Germany represented almost 38.5% of Alsatian imports in 2002. Alsace is a prosperous region, ranking third in France after Ile-de-France and Rhône-Alpes. The region has one of France’s lowest unemployment rates (8.4% in 2011). This is the due to its position on the border with Germany and Switzerland allowing many workers (approximately 70,000) to cross the border where salaries are generally higher, particularly in Switzerland. Alsatian industry has been facing diversification, particularly since 2004 when many potassium mines (Mines de potasse d’Alsace or MDPA) were closed for good. Deep restructuring has affected main activities such as car manufacturing (Peugeot is the region’s first employer with an important site in Mulhouse). beer brewing (half the French beer is produced in Alsace, especially near Strasbourg with sites in Schiltigheim, Obernai and Hochfelden. Alsace’s favourite beer is Kronenbourg. chocolate and confectionery (Masterfood in Haguenau and Steinbourg, Kraft Suchard in Strasbourg, Chocolat Schaal in Geispolsheim). As in most of French regions, the service sector is growing rapidly at the expense of the two first sectors. The first sector, according to its importance, is tourism (6% of the Alsatian GDP). It is estimated that 28,000 jobs are generated by tourism in Alsace, which represents 3.5% of the regional workforce in summer. However, because of its small size compared to the average French region, Alsace ranks 20th for the number of tourists who spend at least one night in the region (11.7 million in 2011). Alsatian gastronomy shares important features with Germanic cuisine. The traditional Alsatian dishes can also be found – with minor differences – in neighbouring German, Swiss and Austrian regions: baeckeoffe, bretzel, flammekueche (tarte flambée), sauerkraut (choucroute garnie), fleischnacka, fried carp (carpe frite). Foie Gras is another specialty of Alsace, particularly from Strasbourg where it has been prepared since the 17th century. In the Vosges mountains, many farmhouses (fermes-auberges) serve an authentic traditional farm meal called “marcaire” which features pie as a first course and roïgabrageldi (potatoes with smoked pork shoulder) as a main. Alsace boasts an abundant range of desserts: kugelhopf (kougelhof or kouglof), apple and damson plum tarts, fromages blancs, gingerbread, as well as bredelas, an infinity of biscuits and small cakes prepared for Christmas. Alsace’s most famous cheese in munster or munster-Géromé which takes its name from the little town of Munster, located in the Fecht Valley in the Vosges. This cow’s milk cheese with a soft pâte and a washed rind received the ‘appellation d’origine contrôlée’ label in 1969. Munster is still being made on either side of the Vosges mountains in Alsace and in Lorraine. Alsace vineyards extend across the hills of the Vosges and produce an average of 150 million bottles of wine each year: Riesling, Sylvaner, Gewurtztraminer, Pinot Blanc, Pinot Gris, Pinot Noir, and Muscat. The local microclimate is favourable for the slow and prolonged ripening of grapes and the formation of grapes of great finesse. In Alsace, the wines are mostly named after the variety of the grapes and not after the land on which they are produced. This originality, unique in France, undoubtedly contributes to their great notoriety. The wines of Alsace (except for sparkling wine) are still sold in gracefully-shaped bottles, which are named “Alsace flûtes”. Since 1972, it has been compulsory for wine to be bottled in the region where it is produced. The wines of Alsace are divided into three Appellations d’Origine Contrôlées (AOC): the AOC Alsace, The AOC Alsace Grand Cru, The AOC Crémant d’Alsace. In addition to the AOC, the notes “Late Harvest” (Récoltes Tardives) and “Selection of Noble Grains” (Sélection des Grains Nobles) designate rare wines, which are most often the most mellow or syrupy. Through the architecture, the dialect, and the cuisine, Alsace is undeniably of Germanic influence. This is due to the region having belonged to the Holy Roman Empire until the 17th century and also to the fact that the region has passed between German and French control four times between 1870 and 1945. The Alsatian dialect is estimated to be spoken by a population of 400,000 to 700,000. Locally known as Elsässisch, it is an Alemannic dialect, part of the High German language. The use of the Alsatian dialect has remained strong, particularly in rural areas. In the Sundgau, it is not unusual to find elderly people who can only converse in Alsatian. However, few young people speak the dialect today. Alsatian does not have official status in France and can only be offered as an optional language at school. There are actually quite a few different versions of the Alsatian dialect between the Bas-Rhin and the Haut-Rhin départements. It is common to see new official bilingual street signs in Alsatian cities and villages. French is the most commonly spoken language in Alsace nowadays. Locals (even non speakers of Alsatian) often express themselves with a distinctive German-sounding accent inherited from Alsatian. It is manifested by the tendency to lengthen the initial vowel of one and two syllable words. The position of Alsace within the Holy Roman Empire at the time of the Reformation complicated further the fragile political balance in the Upper Rhine region. Strasbourg officially became Protestant in 1532, along with Basel, Montbéliard, Mulhouse and Zurich to the south. Strasbourg and the region of Wissembourg were the main bastions of Protestantism, while the rest of Alsace remained Catholic and loyal to the Habsburgs. It is hard to make credible estimates of the numbers of Catholics and Protestants today as religious-based censuses are not tolerated in France. However, attendance at Protestant and Catholic services is reflected by the number of churches still open and which can still be visited throughout the region. The Alsatian costume as we know it today developed during the 18th century and is reminiscent of rural Alsace, of the region’s history and religious beliefs. It also reflects the prosperity of Alsace with its rich material and bright colours. There is not one but several types of Alsatian traditional costume. It can change from one village to another and some areas have their own characteristic costumes which may differ greatly, in particular in the Vosges mountains, the Sundgau and Alsace Bossue. The impressive black headdress of the woman’s costume has now become one of Alsace’s iconic trademarks. 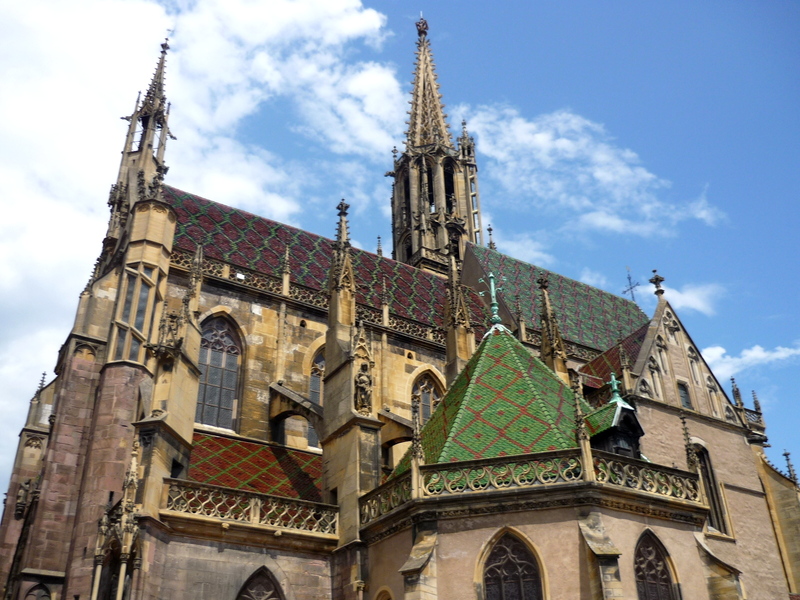 In the past, black was the colour for Protestants as the Catholics’ bow was decorated with patterns. When Alsace was annexed by Germany between 1870 and 1918, illustrators portrayed inaccurately the Alsatian costume which was adopted by the whole region, hence replacing the vast variety of traditional clothing that once existed. The woman’s costume is made up of a white long-sleeved cotton shirt, trimmed with a narrow ruff and a slight low neckline, a squared or rounded ruff, a black (Catholics) or green (Protestant) velvet skirt, a corselet in precious material, a plain apron worn over the skirt and white stockings. The woman wears the famous and decorative bow (la coiffe) made up of large ribbons and embroidered with silver and gold with sequins and motifs. The colour of the imposing headdress varies depending on the religious belief of the wearer: black for a young Protestant or married women, red for a young Catholic maiden. The man’s costume comprises a white long-sleeved cotton shirt with a soft collar, black trousers, a red gold-buttoned waistcoat and a black hat that has a moderate brim and a flat crown. This traditional symbol of the Alsace region can often be admired at touristic and cultural events. Alsatian folk music is essentially orchestral and is closely linked to German, Swiss and particularly Austrian music, due to the history of the region. During rural festivals, the typical Bloosmusik (music to “blow”) is played by a brass band made up of fifteen to thirty musicians (brass, accordion and percussions). Also nicknamed “oumpapa” music, it is accompanied by folk dances interpreted by dancers dressed in traditional costumes. 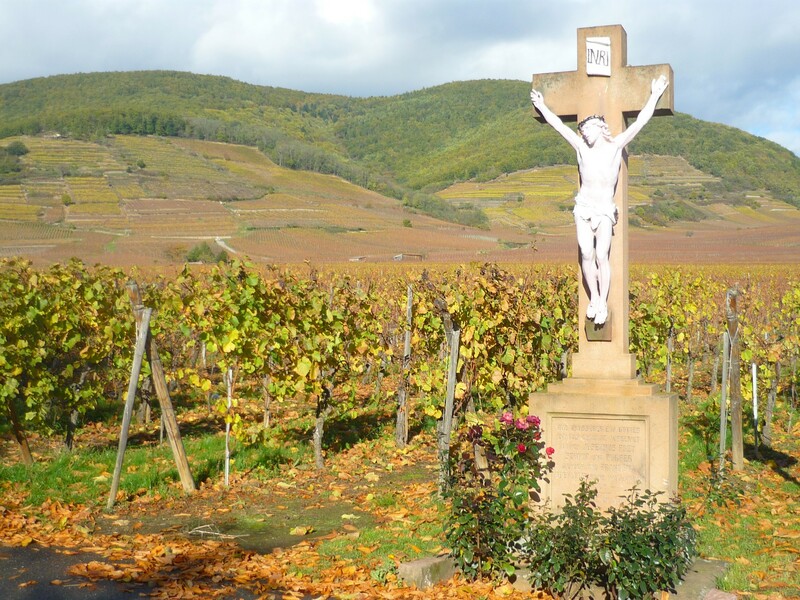 The scenic Alsace Wine Route is 170 kilometres long and was inaugurated in 1953. It criss-crosses through the Alsatian vineyards from north to south from Marlenheim to Thann. Several cities and villages along the Alsace Wine Route have become famous and attract a very large crowd of visitors during the summer months and Christmas where they have beautiful Christmas Markets. These villages are gems of the wine country and often comprise old medieval ramparts, winding alleyways that bloom with magnificent geraniums, winstubs, half-timbered houses and medieval churches. Many town names have become synonymous with rich traditions, friendliness, prosperity and great wines. These include Obernai, Dambach-la-Ville, Ribeauvillé, Riquewihr, Kaysersberg, and Eguisheim. Find out more about the Alsace Wine Route. Sublime countryside, panoramic views extending to the distant Alps and riding on the hills, the Route des Crêtes in the Vosges is continues the reputation of the Wine Route, a reputed and highly frequented tourist itinerary during the summer period. The road follows a ridgeline route of 80km, linking the towns of Thann to Sainte-Marie-aux-Mines. Throughout its course, it is sometimes in Lorraine and sometimes in Alsace. Symbolically, the Route des Crêtes marks the border between Lorraine and Alsace, between the Romance and Germanic language worlds. At each mountainside, the road travels along bucolic countrysides, opening up views of mountain passes, rounded mountains, lakes, rocks, pastures and forests of majestic pines. Find out more about the Route des Crêtes des Vosges. Located between the Plain of Alsace, the Rhine River, the Vosges and the Jura mountains, the Sundgau region has its own distinctive geographic character. The hilly region is covered with pine, beech and oak woods, orchards, pastures, fields and ponds filled with carp, dotted with a multitude of wealthy villages. Like the rest of France, only the spire of the parish church signals the presence of colourful and elegant villages between two hills. Find out more about the Sundgau. 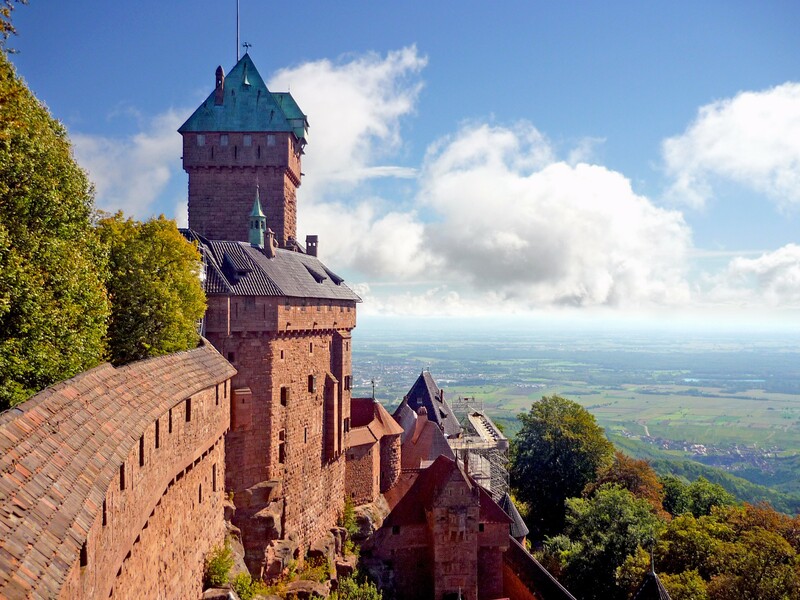 In spite of consecutive wars between Germany and France which have severely affected Alsace, the region has been able to protect its rich heritage of churches and castles. Some of them have benefited from more recent renovations undertaken by the Conseil Général of Bas-Rhin or Haut-Rhin. The touristic itinerary Route Romane d’Alsace (Romanesque Road of Alsace) links the region’s best examples of Romanesque architecture in Alsace. Romanesque: churches in Feldbach, Guebwiller, Kaysersberg, Marmoutier, Murbach, Neuwiller-les-Saverne, Ottmarsheim, Sélestat, Sigolsheim, Strasbourg, Wissembourg. Gothic: cathedral of Strasbourg, collegiates of Colmar and Thann, churches in Niederhaslach, Ribeauvillé, Rouffach, Sélestat, Strasbourg. Alsace is one of the regions of France that has retained the most medieval castles. More than 500 are situated here, mostly distributed from north to south, in the foothills of the Vosges. Even if they are for the most part in ruins, their silhouettes, perched at the top of the Vosges Mountains, have been a part of the countryside for centuries, thus defying time. As in previous times, these castles still seem to dominate the Alsace Plain even today, watching over the Vosges valleys, communication channels and sometimes the abbeys. Some castles still have a great reputation and are in good condition, with their imposing ruins evoking respect and admiration. This is especially true for the castles of Haut-Andlau, the Three castles of Ribeauvillé (Saint Ulrich, Girsberg, Haut-Ribeaupierre), Hohlandsbourg (overlooking Colmar), the Three castles of Éguisheim and Haut-Andlau. The Haut-Kœnigsbourg castle is one of the most visited tourist locations in France, with nearly 500,000 visitors each year. Perched at 747 metres high, it dominates the Rhineland Plain, over looking all the roads leading to Lorraine or crossing Alsace. It was greatly restored between 1901 to 1908 under the orders of Kaiser William II, a great admirer of medieval romanticism. In the northern Vosges still stand the important ruins of a few castles: Falkenstein, Old Winstein, New Windstein, and Fleckenstein. To the south of Alsace, three ruined castles can be visited: Ferrette, Landskron and Morimont. Palaces were built by the influential Rohan dynasty in the 18th century on the plain: the château des Rohan in Saverne and the palais Rohan in Strasbourg. The Musée d’Art Moderne et Contemporain de Strasbourg (MAMCS, Museum of Modern and Contemporary Art), Strasbourg. The Musée d’Unterlinden (Unterlinden Museum), Colmar. The Cité de l’Automobile (the National Automobile Museum), Mulhouse. The Musée français du chemin de fer (French national railway museum), Mulhouse. The Écomusée d’Alsace (Alsace Ecomuseum), Ungersheim. The summits of the Vosges: Grand-Ballon, Ballon d’Alsace, Hohneck, Champs du Feu, Donon. 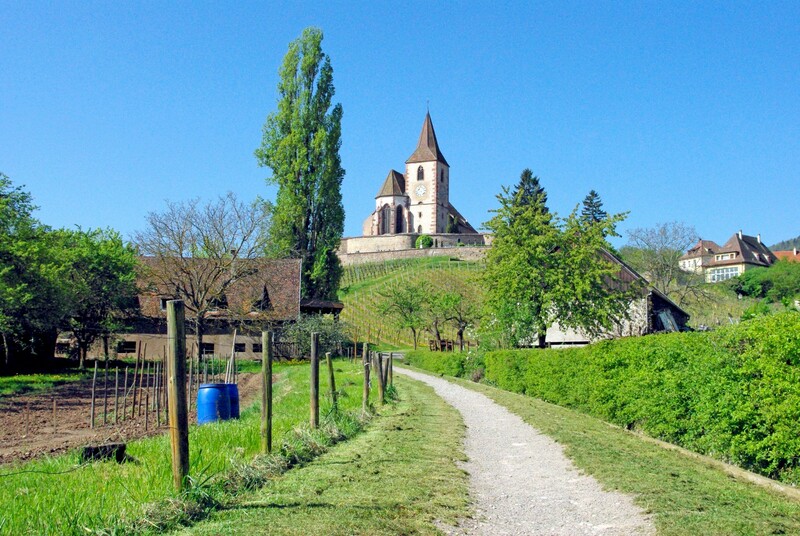 The Mount St. Odile (the convent and the Pagan Wall) near Obernai. The Hartmannswillerkopf, also known as the Vieil Armand, trenches and national monuments of World War I above Cernay in the Vosges. The Natzweiler-Struthof, a former Nazi concentration camp in the Vosges near Schirmeck. The European District in Strasbourg, headquarters of several international institutions. Several cities and villages along the Alsace Wine Route have since become famous and attract a very large crowd of visitors during the summer months and Christmas. These gems of the wine country are often made up of old medieval ramparts, winding alleyways that bloom with magnificent geraniums, winstubs, vaults, half-timbered houses, and medieval churches. Many town names have become synonymous with rich traditions, friendliness, prosperity and great wines. One of them has become over the years a favourite destination: Kaysersberg. Kaysersberg, the “Mountain of the Emperor”, certainly deserves its prestigious name. A tourist hotspot, the little city houses some of the most beautiful half-timbered houses of the Renaissance in Alsace in its entirely pedestrian centre. The city of Kaysersberg and its viticulture are dominated by the castle ruins, which only consists now of a beautiful round tower. The view from its summit offers a panorama of the city, the valley of the Weiss, the vineyards and the Plain of Alsace, and beyond, the Black Forest in Germany. Find out more about Kaysersberg. Have you visited the Alsace region of France? If so can you let us know which was/were your favourite spot(s)? Previous ArticleBienvenue to our brand-new website!